Of course to drink wine is to taste wine: One cannot very well drink without tasting. However, to really appreciate a wine and to experience the range of idiosyncratic flavours specific to a grape or region, a few things are worth bearing in mind. The strict conventions of wine tasting have developed over centuries, and are often enough to put newcomers to the appreciation of wine off altogether! However, it is possible to observe essentially the same practices without the pomp and ceremony associated with wine tasting.In actual fact, to casually incorporate the elements of wine tasting into your drinking, whilst not doing so over ostentatiously will come across better then if you struggle trying to impress with unnecessary formulas and techniques. Wine tasting actually relies on all of the senses bar hearing. The appearance, taste, texture and aroma of a wine are all important. Essentially, of the four, aroma is by far the most significant as taste is 80% related to aroma. The conventions of wine tasting were developed in order to utilise fully the senses of touch, taste, smell and sight. First things first, a wine is smelled or ‘nosed’. The best way of doing this is to agitate the wine slightly by twirling the stem of the glass in a slight circular motion, being careful not to become over zealous and spill any! 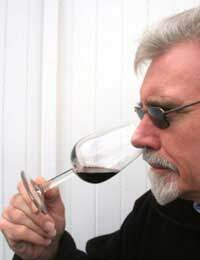 Now that this will have activated the cells the wine taster generally takes one big sniff with the tip of their nose placed in the wine glass close to the wine, followed by several smaller sniffs. These two best known of the tasters rituals (the swirl of the glass and the sniffing) merely serve to increase enjoyment of wine by allowing the drinker (or ‘taster’) to discern the range of flavours in a wine. If one does not smell the wine the full possible range of flavours that may be communicated to the brain will be lost and taste will suffer consequently. Next, the colour of a wine may be discerned by holding a glass of wine up to a plain white background and tilting it so that wine can be seen on the rim of the glass against the white. Following this a taste will be taken, ensuring that air is also taken in with the modest mouthful of wine. The wine is then rested on the bottom of the mouth whilst air is inhaled softly in slight sucking action over the wine. This all serves to aid smell and taste, the flow of airwaves involving the olfactory sense as much as possible. Whilst tasting the wine, its ‘body’ will be discerned. ‘Body’ is a curious element to wine and that though related to taste has more to do with the texture of a wine. Full bodied wines are ‘meatier’ than lighter bodied ‘flowery’ wines. The body of a wine is something that can be noted naturally as the wine rests in the mouth.Following this the wine is spat out into a ‘spittoon’ or it can be drunk. The reason professional tasters generally spit wine out is that drinking too much wine may affect their judgment of the many wines left to taste during that tasting session. By breaking down the above elements it has hopefully been demonstrated that the conventions of wine tasting are in fact simple devices that aid the enjoyment of wine. Further, all of these elements are things that can be employed easily in a relaxed drinking environment. Often the seriousness of wine tasting can put one off really trying. However, amongst friends drinking can be enjoyed even more by paying attention to the aroma, taste and texture of a wine as part of your drinking and eating routine.